I didn't realise how poo my old charger was until. I bought the Oximiser. The Oximiser is simple to use, its display is clear and easy to read and when I've fired up my bike after it's been charging the engine appears to spin up quicker.. after checking with a multimeter, the battery's voltage and amps are a couple of notches higher than after charging with my old meter. How? I have no idea, it's all electrickery to me. Oximiser comes with both sets of connection cables, crocodile clips and eye connectors with easy connection plug so you don't have to undo your seat each time you want to charge. 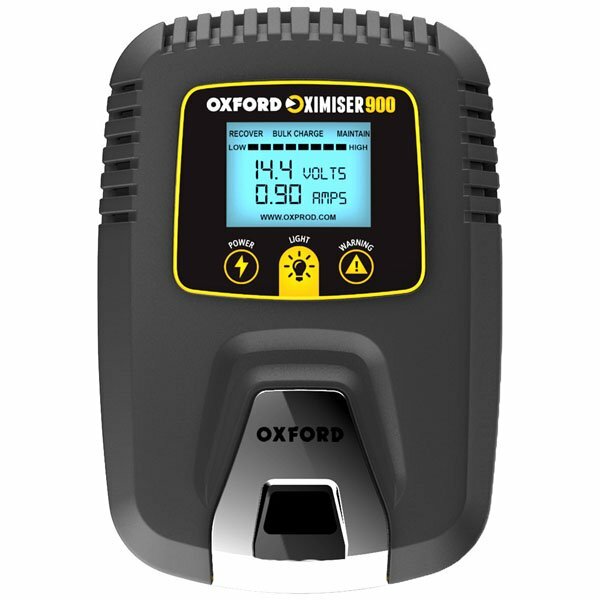 Bought the oximiser and charged battery easily and quick, then it goes into maintenance mode. Does exactly what it is supposed to do with extras! Brought my dead battery back to life within a couple of hours, initially I just used the crocodile clips in case the battery was beyond use, but wired in the screw terminals cables (which I didn't realise were included) afterwards to make it easy to unplug and ride. The product did exactly what it said it would, with just one overnight charge the battery was good to go. I've connected the easy connectors to the battery which was straight forward to maintain the battery. Product great but did have to wait longer to get the oximiser due to poor postal service, which wasn't any fault of sportsbike shop. Have used the guys before with no issues at all, and will use again in the future. Poor quality, hasn't lasted the test of time! I purchased two of these to keep my bikes batteries going through winter. Within a year both have failed at the connectors that join the charger to the quick join connector from the battery. The device is poorly made and feels cheap, clearly Oxford have tried to cut costs by making it with cheaper materials. As usual sportsbikeshop have been excellent with the returns. I have purchased a replacement (different brand for similar money) and instantly can tell it's built a lot better. I would steer clear of this Oxford Oximiser, it's very cheaply made but without a particularly cheap price. I would expect better from a big brand like Oxford! Great piece of kit essential to keeping the battery in tip top condition. Leads slightly short but that's only a minor issue. As usual terrific service from sportsbikeshop. Excellent piece of kit. Includes all wires/connectors and a hard wired one ,which you can attach to your bike with a waterproof cover. Simply to use and then you can forget about it for the winter..Great bit of equipment, good price and build quality and a good guarantee.. It does what it says but built quality isn't good. Cheap plasticky feel and they have really saved money on the plugs.. you have to push hard for them to connect. However it does trickle charge your battery, has a light and shows voltage of the battery. This is a great little unit for keeping your bike battery topped up, for example due to drain by an alarm over time. It is compact and comes with a lead to permanently attach to the battery making plugging in easy. It seems robust and my other Oxford charger has lasted years so should not be a problem. The only criticism is that the mains lead to the unit is quite short, 32 inch (compared to 56 inch on my other charger) and I don't need Oxfords web address in the display so the digits could then be larger. Cracking bit of kit. Two fixings, 1 permanently fitted to the battery that u just plug into charger and croc clips for the terminals for when u take battery off. Keeps battery topped up nicely, a warm welcome for the winter months when my bike's hibernating. Purchased this item as i had one previously for years worked faultlessly, only getting this new one as dropped old one in a bucket of paint! no coming back from that. Easy to use easy to read simple to use, ticks all the boxes! !